“FOR THOSE WHO DARE TO EXPLORE FURTHER.” Open up the left cuff of REV’IT!’s new Ridge GTX (Gore-TeX) jacket and you’re greeted with a reminder that it’s special. Unlike other pieces of high-end technical protection, what makes the Ridge special isn’t a laundry list of features – it’s how they come together. That’s not to say that the features aren’t worth noting: a laminated 3L GORE-TEX keeps water out but allows your sweat to escape. CE-Level 2 SEEFLEX armor is standard in the shoulders and elbows, plus there are inserts for back and chest protectors. 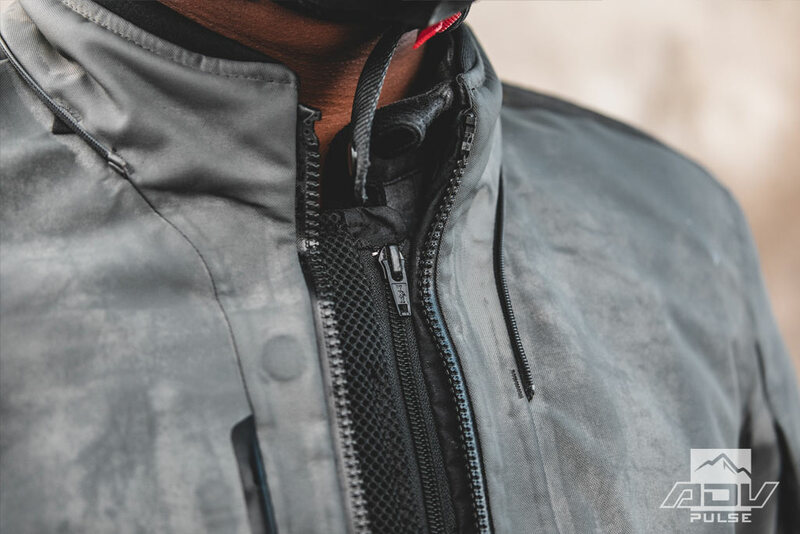 Ample airflow is provided by venting zippers in the arms and back, but the pièce de résistance is a clever 3D mesh panel hidden behind the main zipper. When the weather presents a challenge, zip in the removable storm collar to maximize protection from rain and wind. REV’IT!’s explanation is that the Ridge GTX offers “all the tech, none of the clutter.” The recipe is technical excellence, minimalist design, and a touch of exclusivity – just 500 examples have been built worldwide. The Ridge GTX Jacket features a Three-Layer Gore-Tex shell and Seeflex CE-level 2 protectors at the elbows and shoulders. 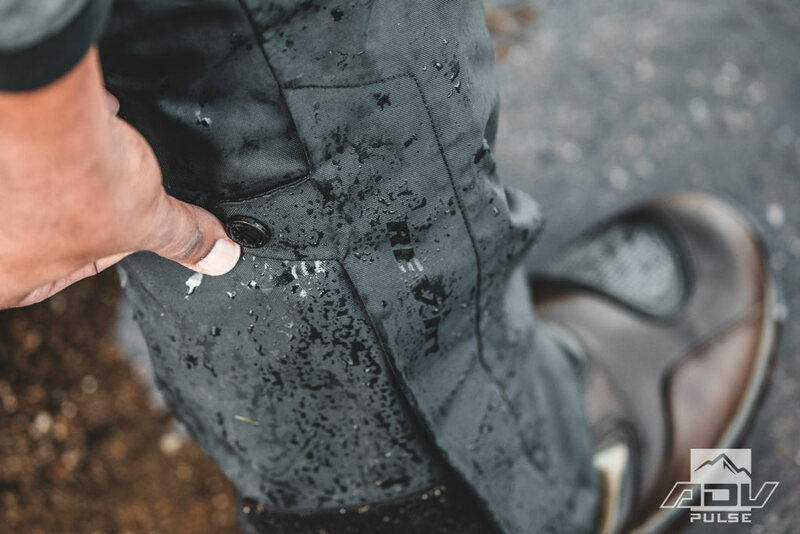 The Globe GTX Pants have a Two-layer Gore-Tex shell with Seeflex CE level 2 armor at the knees and Seesmart CE level 1 armor at the hips. To keep the subtle aesthetic, the Ridge GTX jacket is best paired with the Globe GTX pants. While the styling may be low-key, the pricing is not: the Ridge jacket is $869 and the Globe pants are $529. Are these two REV’IT! offerings worth the dough? I tested them in the urban jungle of Los Angeles and the actual jungles of Costa Rica to find out. 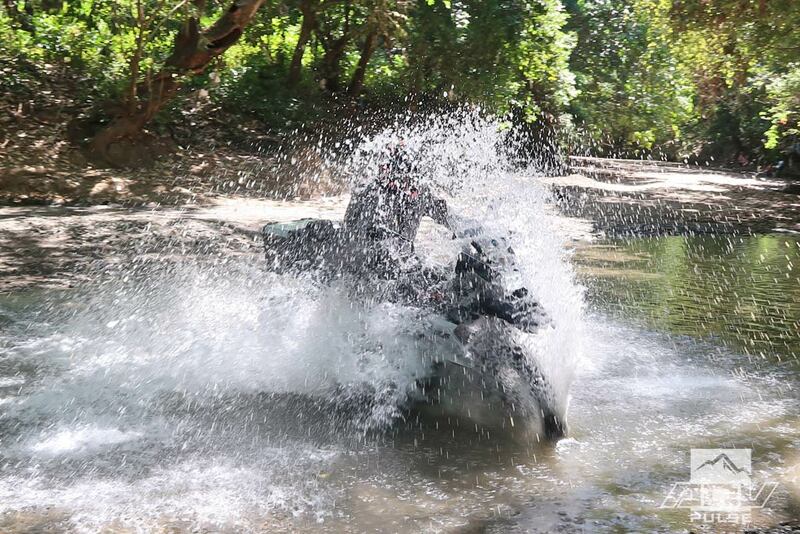 My testing started with a New Year’s trip around Costa Rica on a BMW R1200GS from Elephant Moto. 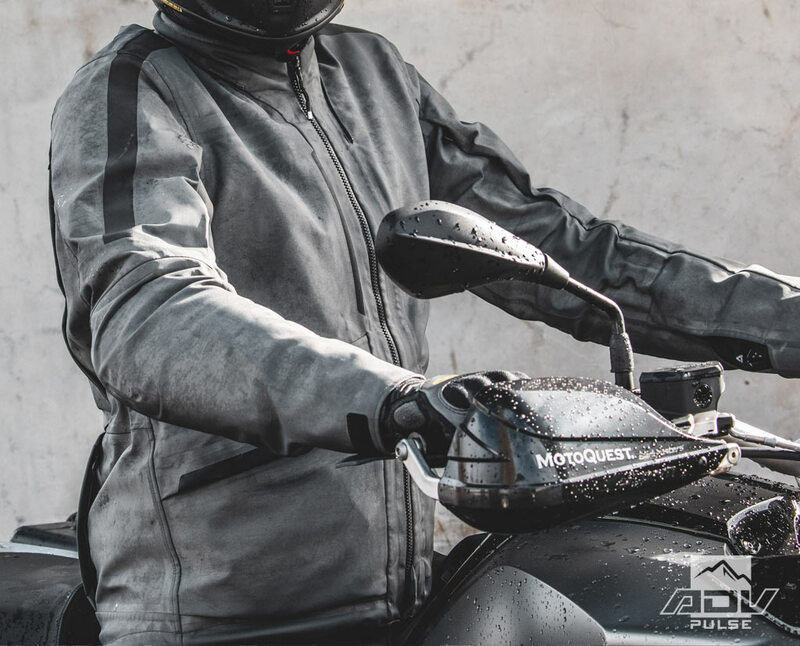 From the beginning, it was clear that both the Ridge jacket and the Globe pants are well-built, and I appreciated that the svelte nature of both products made them much easier to pack in my checked bag than most other motorcycle gear. I didn’t encounter any precipitation in Costa Rica, but there are other ways to make it rain. The Ridge GTX is delightfully light for the features it offers. Much of this is due to the 400D 3L GORE-TEX fabric, which allows the jacket to be waterproof and breathable without having to be thick. Further weight savings come from the lack of an inner liner, which also meant that I needed a mid-layer to feel comfortable in the 50-degree temperature of Costa Rica’s capital, San Jose. As I headed towards the coast, the temperature rose to 95 degrees and I opened every zipper I could find. Both the Ridge and the Globe have two VCS (Ventilation Control System) zippers in the front, though the jacket also has two zippers to open large exit vents in the back. Whether they are open or closed, the vents are hidden behind integrated flaps that preserve the minimalist design. Globe GTX pants have two large VCS (Ventilation Control System) zippers in the front. 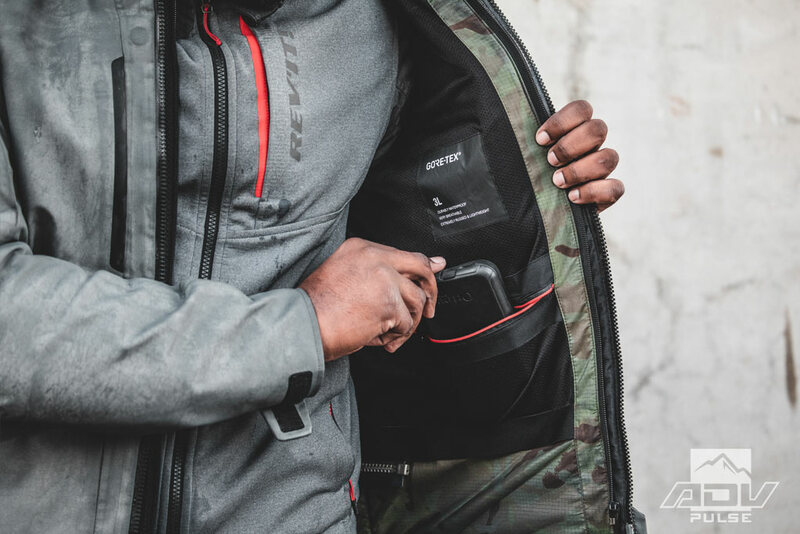 The standout air management feature is hidden behind the main zipper – open it up and you’ll find a second zipper attached to a full-length strip of 3D mesh that dramatically increases airflow while also ensuring that the jacket still fits securely. The temperature stayed between 60 and 90°F for the rest of my trip, and the gear was well-suited in that range. 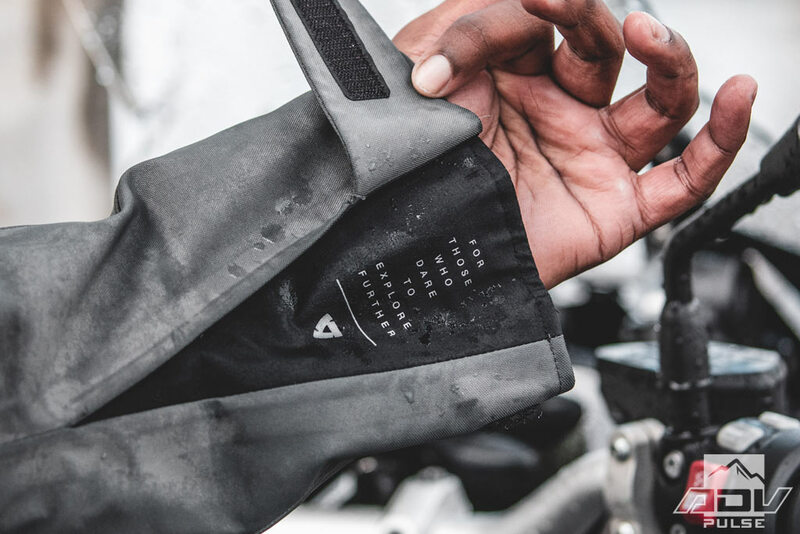 With that said, excellent ventilation in the center of any jacket can be stymied by the windshields typically found on adventure bikes. While I was cooking off-road in the Costa Rican sun, I wished for some forearm vents to get more airflow into my sleeves and wondered if they were omitted to preserve the styling. A consolation prize is that the 3L GORE-TEX shell breathes well and permits your perspiration to evaporate away and cool your skin, especially when the main 3D mesh vent is open. This full-length vent is a welcome feature when the temperature starts rising. 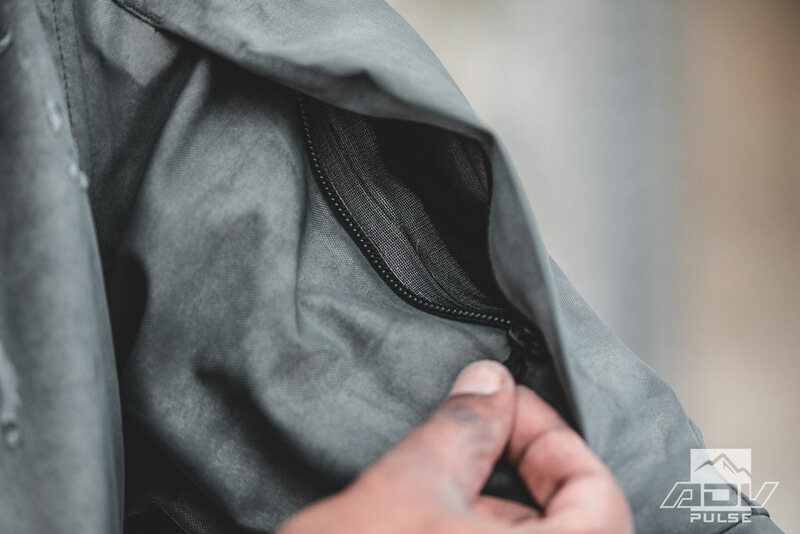 One of the drawbacks of the Ridge’s streamlined design is a lack of storage capacity compared to traditional ADV jackets. 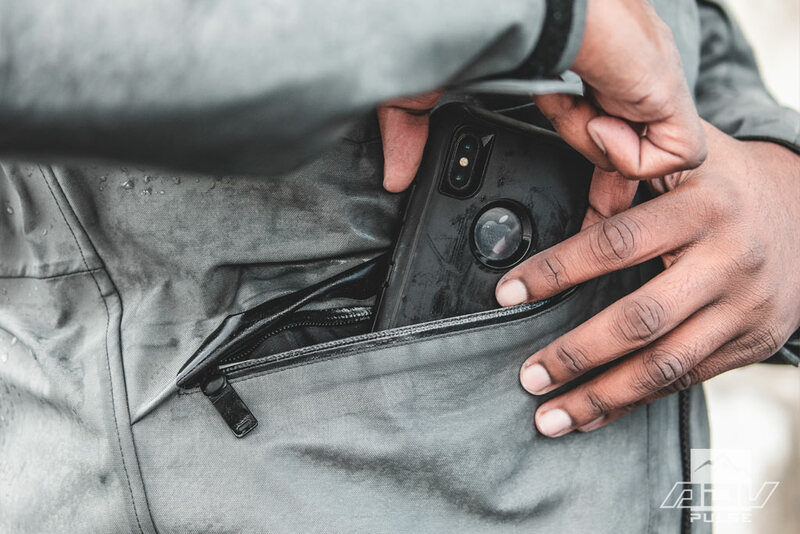 It features three pockets up front: two hand-warmers that are large enough to fit an iPhone X horizontally, as well as a chest pocket best suited for smaller objects. There are two inner pockets, but they are too small for my liking. Many ADV jackets have a large rear pouch, but I like how REV’IT! has incorporated rear storage in a very subtle way. I’m 6’2” with a 44-inch chest/34-inch waist and I wore an Extra Large jacket and Large pants. Both garments have a Euro (read: slender) fit that I appreciate. The jacket had enough room for a mid-layer, but I would need to go one size up in the pants to wear a layer underneath them. 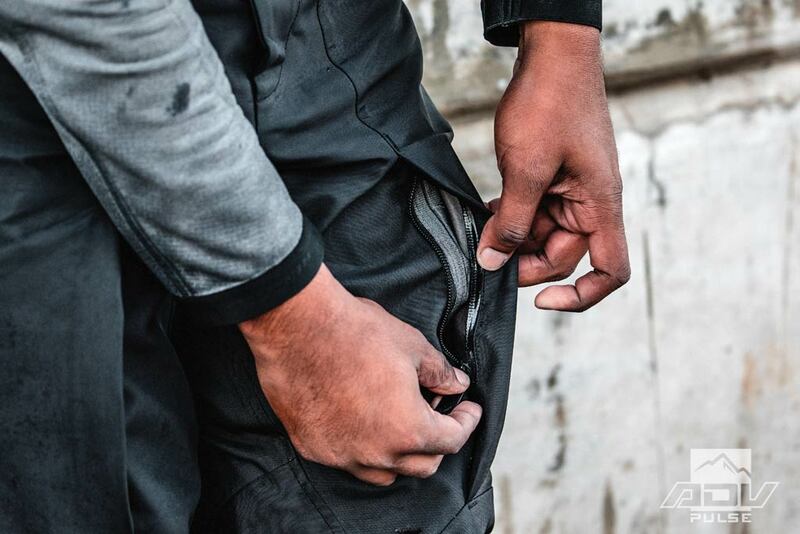 In both garments, the fit is almost unaffected by REV’IT’s SEEFLEX armor, which is barely noticeable thanks to the small size, flexible structure, and light weight. During my first week with the gear, I had only two complaints. First, the water-resistant zippers were stiff and nearly impossible to manipulate while wearing gloves. I kept a point-and-shoot camera in one of the front pockets during my trip, and I became so frustrated with the zipper that I simply left it open. Second, while I prefer a slim fit when it comes to gear, the Ridge is too tight in the neck. This would be less of an issue if it had a more comfortable collar liner, but it’s the same quasi-camo liner that adorns the rest of the jacket interior edging and it’s irritating against my skin. I had to leave the top inch of the zipper undone to give my neck some room. Obviously, this will depend on your neck size, but I mention it because I’ve never had this issue with any motorcycle jacket before. If you’re in hot weather and you’re using the central mesh zipper, it won’t be a problem. Despite that, my first impression of the Ridge GTX jacket and the Globe GTX pants was quite favorable. I had been hoping to test the waterproofness, but I barely encountered any precipitation while in Costa Rica. The rain gods must have heard my concerns, as they had plenty waiting for me back home in Los Angeles. 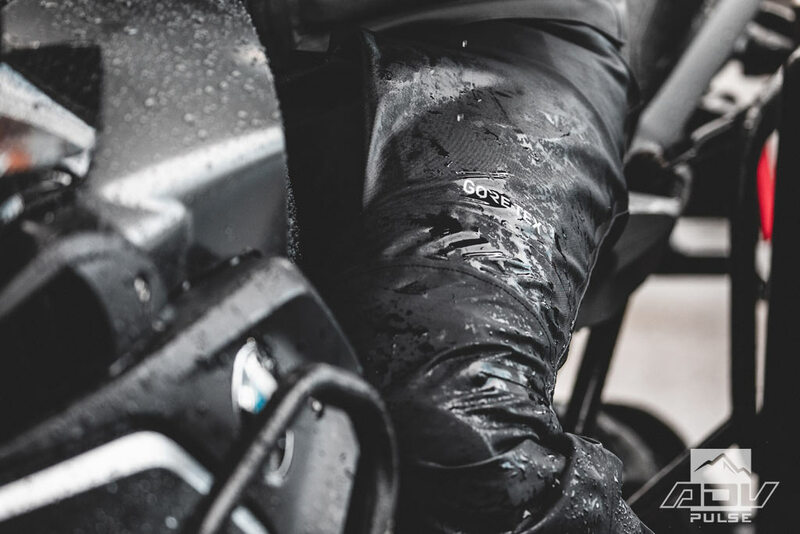 I kept things consistent with another BMW R1200GS – this time from MotoQuest – and set out to see how the Ridge and Globe would put up with the wet. In the rain, both my complaints faded away: the zippers started to break in (they’re still stiff, but now they’re at least functional) and the tight collar ended up becoming irrelevant due to a hidden bonus in the Ridge. 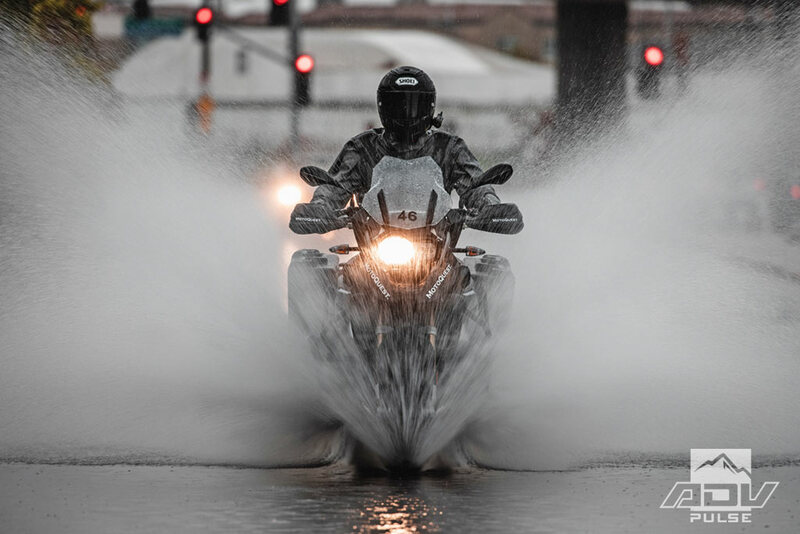 When the weather gets cold and/or wet, you can zip in what REV’IT! calls a “storm collar.” Made from the same GORE-TEX bonded material as the jacket, it provides extra coverage at the neck from the elements. The top is elasticated to stay snug and it’s kept in place with Velcro and a magnet. Because it overlaps the top of the main zipper, I could leave the latter slightly open and still stay completely dry. When you don’t need the storm collar, you can unzip it and stash it in the well-hidden lower back pocket. The circular silhouette shows how the storm collar stays in place with a magnet in addition to the zipper and Velcro. 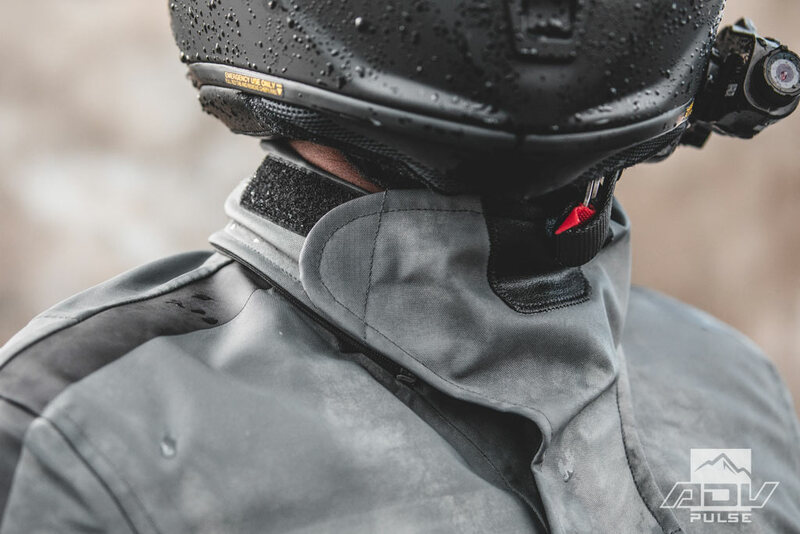 A zip-in ‘storm collar’ provides extra coverage at the neck from the elements. I thankfully didn’t test it, but both the jacket and pants are equipped with CE-level 2 armor in the shoulders, elbows, and knees. There’s CE-level 1 protection in the hips, and there’s optional Level 2 back protection/Level 1 chest protection. Both the Ridge jacket and the Globe oants are ideal for riders that want top of the line adventure gear in a lightweight package that doesn’t make them look like an Ewan McGregor impersonator. The minimalist design is perfect for someone that wants to wear technical protective apparel on a wide variety of machines and still look stylish. Versatility is a constant theme – you won’t appear out of place whether you’re commuting to work or conquering the Dalton Highway. 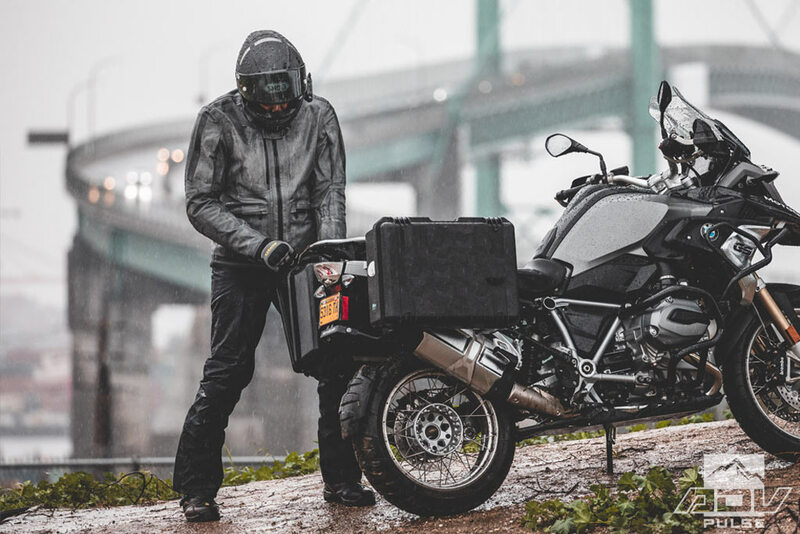 If you’re consistently riding in extreme heat or cold you should look elsewhere, and round-the-world travelers will want more storage but the Ridge and Globe should appeal to most adventure riders as it handles the majority of conditions they’ll encounter. The Globe GTX pants are well-built and feel like they will last decades, but the small feature set has me questioning the $500+ price tag. On the other hand, the technology baked into the Ridge GTX jacket makes it worth the price of admission. I’m impressed by how versatile the Ridge was in the tropical Costa Rican climate and the uncharacteristically wet California winter despite its lightweight construction and non-traditional styling. 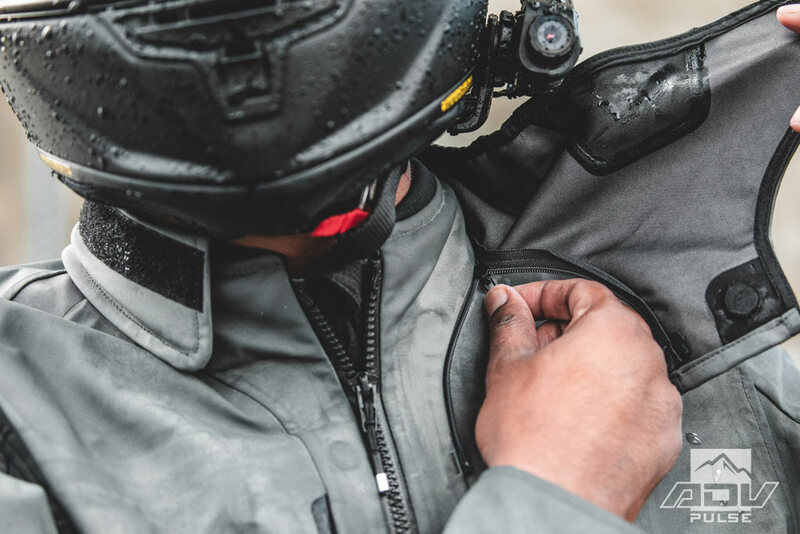 The Ridge doesn’t just look unique in the world of motorcycling – it looks like what astronauts will wear in the future. The storm collar and full-length central mesh vent are rare innovations, and I hope that such features will eventually trickle down into future cheaper models. Distinctive style doesn’t look like regular ADV gear. Storm collar and full-length mesh vent are standout features. Much thinner and lighter than similar waterproof gear. More room in the neck. Waterproof zippers are difficult to operate.